They are loud devils, are they not? This is something our two cultures share, the shrieking of gulls. 🙂 Thank you for starting my Monday on the right foot, my friend. 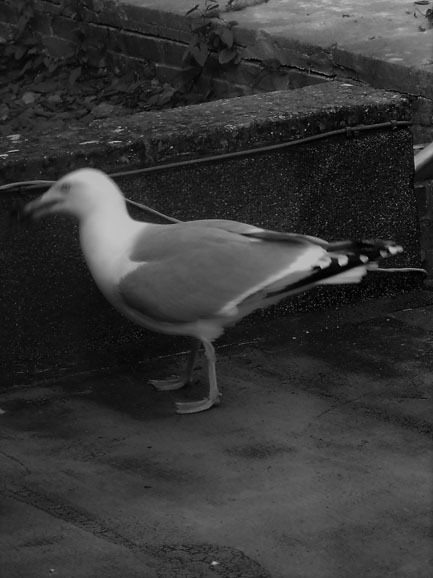 Fortunately, we don’t get as many gulls in my garden as the dog-less gardens. This is one bird that my dog is allowed to see off from her territory. The seagull in my picture was taking advantage of my dog being indoors, although the noise was right over where she sleeps, so it was probably a great joke at her expense. Where I used to live, a young seagull fell out of its nest into the next door garden, so every time I went outside, its parents tried to dive bomb me. I remember one day being out in the garden, trying to hang my washing on the line with one hand, while holding a pole high in the air with the other, so the gulls swooped at that instead of at me! They are loud, no doubt about that! I love you compare them to pterodactyls! Course, I’ve yet to hear them stamp thst loud! When you’re happily fast asleep and dreaming, with your window ajar, and they stamp, it gives you such a jump, the sound becomes amplified during the process of your rude awakening! Now that’s an excellent name for them! Hah, whenever I clean my car (which is very rare), it’s an open invitation for every seagull in the neighbourhood to use it as a toilet! PS I’m thrilled that you’re still visiting my blog, Sunshine, even though you’ve closed your blog down. I thought you’d disappeared completely. I did try sending you an email, but your email address that went with your WP Gravatar didn’t work. Best of luck with your novel. I’m just getting my latest ready for a round of submissions to literary agents and publishers. I really hope there are some takers, as I have very mixed feelings about self-publishing anything further. I am happy to do marketing, but would prefer it was with the support and guidance of a literary agent. Yes I left the Fairy up for a while after my farewell post but then decided it was time to turn the lights out. It was time in general to close that journal and embark on something new. Haven’t quite decided what that’s to be; it may wait until I have a website to promote the book when it’s published, and that’ll be under S. Hesper Jansen. Odd that the email address didn’t work but you can find me at sunhesjan at Gmail if you need me. Thanks. I’ve made a note of that email address. I love the sound of gulls. Wonderful. Gulls sound better in the middle or far distance. Close to, especially when you’re trying to sleep, they can be a bit too raucous, although magpies are worse! I love the sound of gulls down on the beach or on clifftops, or wheeling around in the sky on a windy day. But I guess we’ve eaten into their territory and our buildings have become an extension of their cliffs! Happy Monday…er…Tuesday. I’m a little late in making it over here, but your haikus make me smile at the thought of – despite their loud quacks – ducks and swans – I could just watch them all day long. Hehe. There’s a lake near to where I live and so many ducks from all over of all kinds of varieties. I realize you’re talking about seagulls, but the effect is the same: curious little creatures who make such noise but then I just love their mannerisms. Hehe. Have a wonderful week! We have a wealth of Canadian geese here. The’re protected so they walk, fly and poop freely among us. I’ve been stopped a couple of times in traffic to allow whole families cross the road. As I write this comment, they are honking their way over my roof. I think they’re also wearing hobnail boots. Love you haiku. We had some geese arriving from Scandinavia for the Winter and their arrival went on for about a fortnight, from dawn until dusk. I loved seeing them flying over my garden, honking away. Every time they flew over, I rushed outside to see them. This excited my dog, so she rushed outside, too. She’s very interested in anything that flies over, including all the planes during our local airshow every year. Of particular interest was the World War 2 Lancaster bomber, as it makes a very interesting and different noise to modern aircraft. Seagulls definitely have attitude! Once a year in our park, they come under attack by the rooks who swoop down and drive them away. It’s a most impressive and noisy battle whilst it lasts. Previous Previous post: Friday Fictioneers — Threat or Intention?